Vitamins and Minerals are frequently used to supplement a pet’s existing diet and ensure long-life and a continued healthy existence. At RECORP Inc., we have achieved significant success with Miner-all. This product offers superior quality and nutritional value. Each package includes easy to follow guidelines on daily usage, resulting in a balanced approach to addressing your pet’s dietary needs. 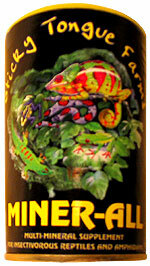 Miner-all comes in a formula for indoor and outdoor reptiles. The indoor formula is specific to pets that remain inside at all times. The outdoor formula is suitable for pets exposed to natural sunlight. Miner-all is a suitable multi-mineral supplement for exotic pets, namely reptiles and amphibians. It should not be used with common household pets such as cats or dogs.